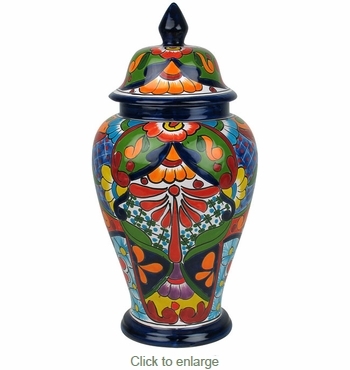 This elegant Talavera lidded vase will add a pop of color to any niche or end table in your home. The colorful tradition of Mexico comes to life in these authentic handmade and hand painted accessories. These Talavera accessories are a great touch for any room in your southwest, Spanish colonial, or Tuscan style home. Traditional Assortment: The design shown is of the Traditional Talavera style. Your vase with lid will be chosen from our current assortment of available colors and designs. The item you receive will likely be different than pictured here.